Canoemobile Tour helps bring universal access to nation’s waterways. Don’t underestimate the power of a band of traveling canoes. This summer and fall, three rigs — called the Canoemobile Tour — will be traveling around the country, towing fleets of six, 24-foot voyager-style canoes. The overarching mission? 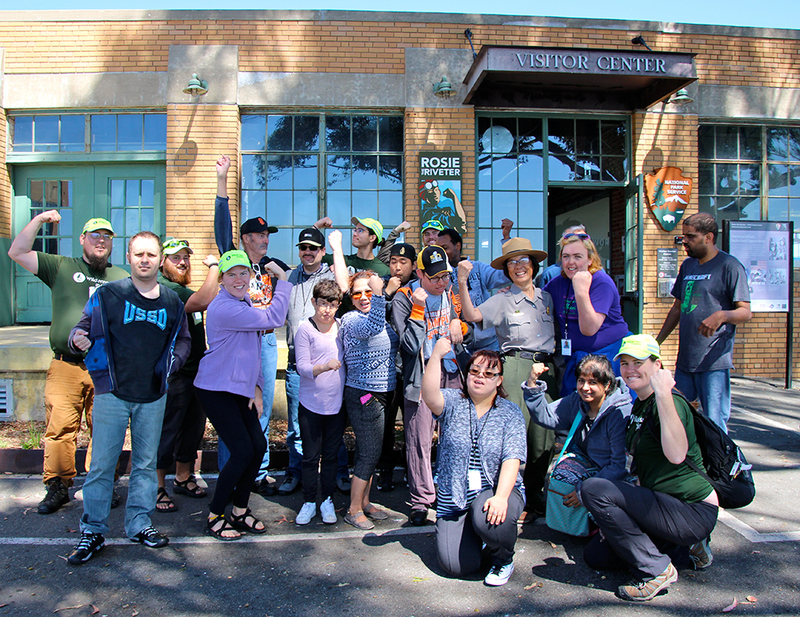 To broaden our nation’s access to National Parks and waterways, regardless of a person’s background or capability. At each tour stop, folks of mixed abilities are introduced to the equipment, skills and safety, and taken out on the water. Many are venturing out for the very first time. 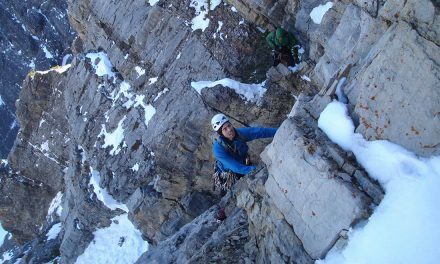 Outdoor stalwart Toad&Co is providing substantial backing to get people involved. 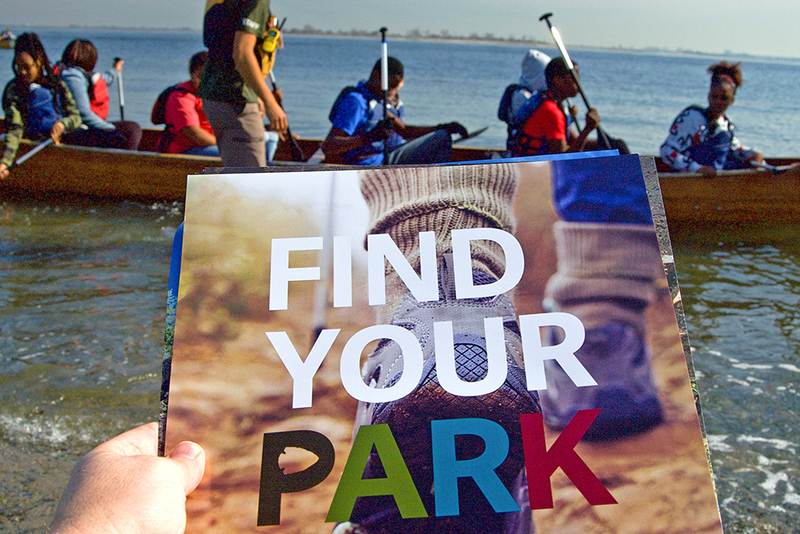 Through financial and logistical support, the brand is helping to power a leg of this year’s Canoemobile Tour, connecting 1,000 adults with disabilities to urban national parks in 10 cities across the country: San Francisco, Washington, D.C., New York, Atlanta, St. Louis, Boston, Chicago, Dallas, Philadelphia and Richmond. This year, Toad&Co honored the 100th birthday of the National Park Service with a $125,000 endowment to the National Park Foundation. Among the brand’s annual donations, this is its largest single allocation to date. The gift came with one request – that the fund be used to help create universal access to the parks for adults with disabilities, which aligns with the brand’s abiding social mission to create opportunities for people with disabilities that allow them to live their lives to their fullest. According to the most recent U.S. Census data, 1 in 5 people in the U.S. have a disability. The National Park Foundation proposed a three-way collaboration with the Canoemobile Tour, operated by Wilderness Inquiry, a Minnesota-based organization that connects people of all backgrounds with the outdoors including programs that focus on populations of disadvantaged youth and those with physical or cognitive disabilities. The idea for the Canoemobile Tour arose from a former initiative, in the Twin Cities area, to take 100,000 urban kids on canoe trips. Partnering with the NPS, the organization hit its goal two years later, in 2008. 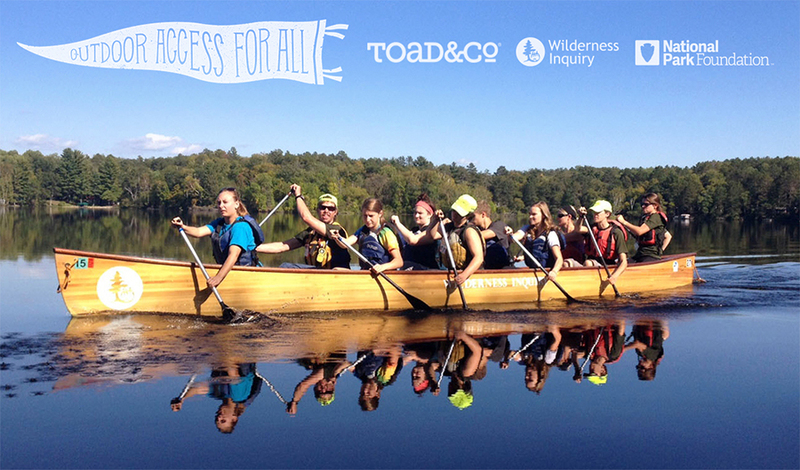 Then, Wilderness Inquiry expanded the localized boats-for-access initiative nationwide. Initially called Urban Wilderness Canoe Adventures, the name was rebranded in 2013 as the Canoemobile Tour: a spin-off of the bookmobile movement, which ultimately helps to spread education and knowledge. “For 50 years, I have seen bookmobiles and libraries help rural Americans become more literate. We coined the term Canoemobile to bring environmental literacy to urban youth,” Lais said. That first year, the tour visited seven U.S. cities. 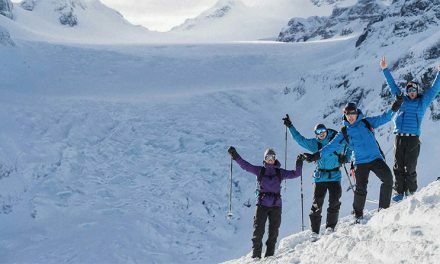 Now, the list is five times larger with stops in 35 to 40 cities, and introducing close to 25,000 people to the outdoors. Canoemobile checks off locations across the West in the spring and goes through Eastern states in the fall. Toad&Co also aims to activate participation in all 45 locations (a number that still has the potential to grow) along the tour, through the help of its retailers, which total to nearly 850 storefronts. “We contact a retailer to see if we can have the Canoemobile parked in front of their store, so people can become aware of the program, sign up to volunteer, or if they know someone with disabilities, get them signed up,” said Sarah Matt, Toad&Co marketing director. 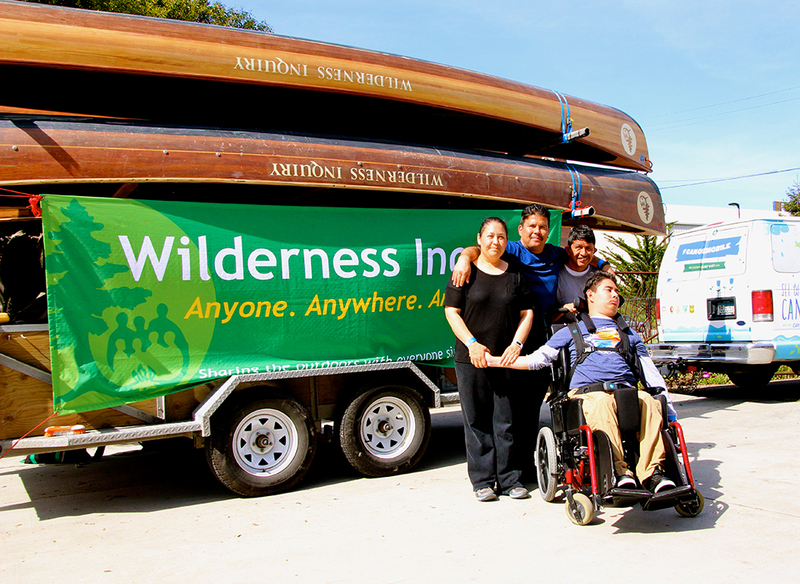 Canoemobile and Wilderness Inquiry direct their support and services to people of all backgrounds, age and ability. Toad&Co has a focus on adults. When a person with disabilities turns 18 years old, the government no longer provides services to them. Support then most often arrives through nonprofit organizations, explained Matt. To help, Toad&Co co-founded Search Inc., a nonprofit based in Chicago that provides a variety of educational programs, support and services to adults with disabilities to help establish the best living arrangements and prepare them for employment opportunities. Another objective of the plan is from the National Park Service — to prove and diversify the parks’ relevancy to new populations. Since the NPS’s establishment, in 1916, the nation’s urban population has grown from 50 to 80 percent. The country’s demographics alter how parks are cared for and perceived, the type and impact of visitation, as well as the ongoing development and support as outlined in the 2016 National Park Service Centennial Urban Agenda. Canoemobile Tour locations include stops near major metropolitan areas to connect populated communities with lesser known and nearby wilderness areas and waterways — lakes, rivers, and estuaries — like Minnesota’s Fort Snelling State Park or Skokie Lagoons near Chicago. “When you think of the National Parks it’s probably Yellowstone or the Grand Canyon — iconic American destinations that everyone wants to visit. But there are a lot of parks in major markets like Chicago and Atlanta. 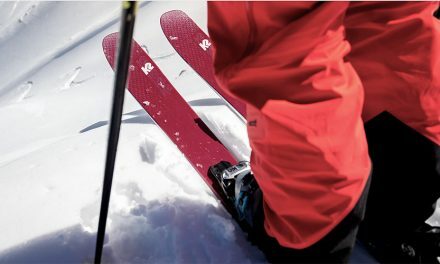 We are looking to identify with and raise awareness of parks that are in everyone’s backyard and not as well known,” Matt said. 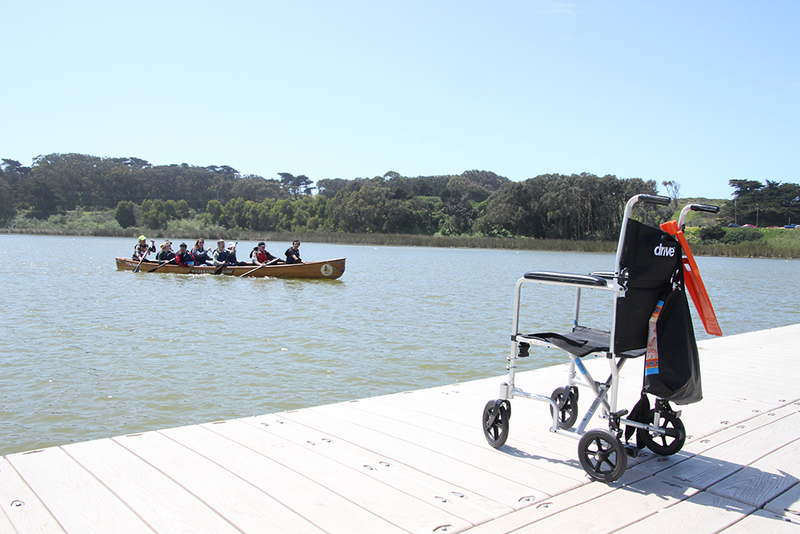 The tour kicked off in April with a paddle in the San Francisco Bay. Followed by Santa Barbara, where Toad&Co employees and Matt joined the Canoemobile crew to help run the show for two days alongside the Alpha Resource Center, a nonprofit that provides services and support to people with developmental disabilities and their families. Canoemobile rigs typically spend 2-to-3 days in each location. About two rounds of paddling take place, daily, bringing about 45 people onto the water. Many of the participants, Matt shared, had never ventured in a canoe or were getting out on the water for the first time in their lives. “Part of the initiative is to create opportunities for people with disabilities, and part is to connect and become comfortable with them,” explained Matt, which echoed Lais, who said that the Wilderness Inquiry’s work with mixed-ability groups helps to introduce people with disabilities to the outdoors, and also introduces people without disabilities to those with disabilities, helping to dissolve stereotypes. Ultimately, the trio’s coalition has been strong and grounded in one common goal: “We are trying to increase awareness of the fact and idea that people with disabilities can do anything. Create access for all, means that people with disabilities should have access, too,” said Matt. And building that bridge of access is just the beginning. Once new adventurers feel the joy of exploration for the first time, no matter who they are, they realize, where should I go next? Grab a drink and talk about creating outdoors access for all. Join Toad&Co CEO and OIA Chairman Gordon Seabury, Wilderness Inquiry Executive Director Greg Lais and National Park Service Conservation and Outdoor Recreation Program Chief Bob Ratcliffe to discuss the benefits of universal access to our national parks at the Canoemobile booth located at the Street Scene in front of the Pavilion, August 3 at 4:30-6 p.m.